When I’m in the mood for grilled salmon or tuna (aka flavorful fatty fish), a rich, fuller-bodied Chardonnay or a Pinot Noir that flirts with elegance and finesse usually tops my list. For me, this is a pairing where the food and wine totally complement one another; bringing out each other’s best traits to create a pleasant dining experience. Around my house, I lightheartedly call this sort of pairing a “Wine Connection,” and I’m the matchmaker. Eat your heart out, Chuck Woolery! While there are a lot of other wines that will work with this dish, there are also suitors you may want to avoid. For example, a heavy, dominating red wine could possibly overwhelm even a fatty and flavorful fish like salmon or tuna. Conversely, a lean and light white wine may be overcome by the dish. 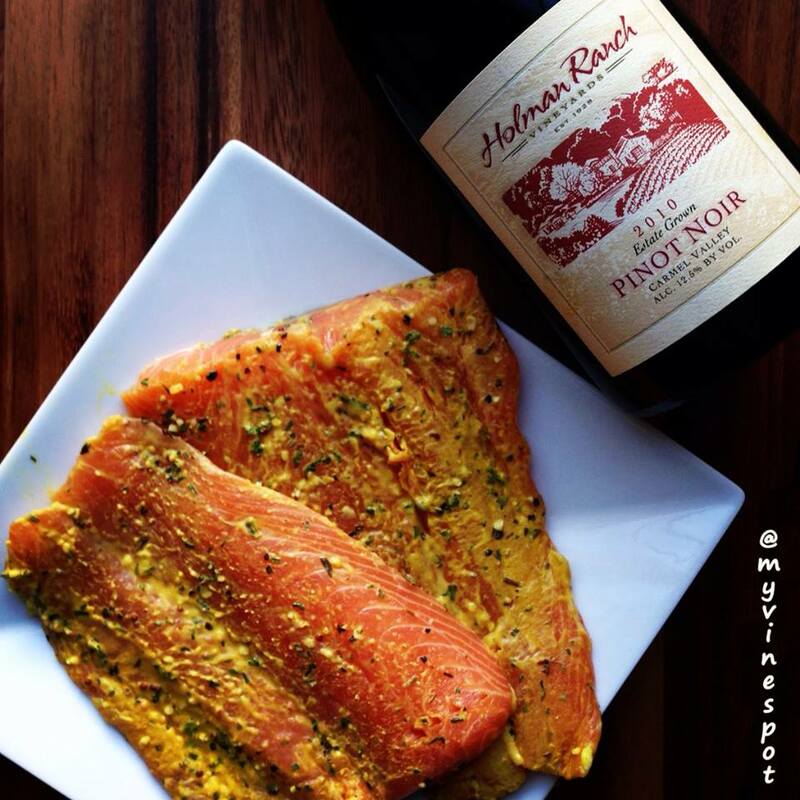 The key to a successful food and wine marriage is harmony and the Holman Ranch 2010 Estate-Grown Pinot Noir pairs beautifully with the Dijon baked salmon. The acidity from the wine and the richness of the salmon balance each other nicely and combine wonderfully in the mouth. If you don’t believe me, try it for yourself! For further information and where you can find this wine, check out my tasting note below. 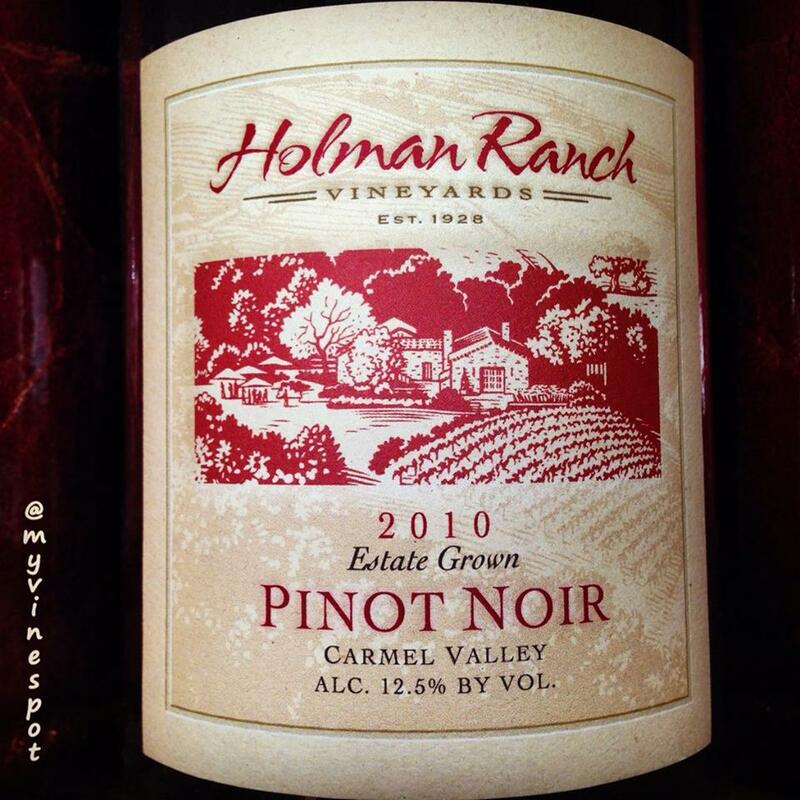 Review: Holman Ranch 2010 Estate-Grown Pinot Noir (SRP $33): Grown at an elevation of 950 ~ 1,150 feet in sedimentary soils, this wine is lithe and fresh with an inviting combination of black cherries, dark stone fruit, tart cranberry, floral tinged perfume, and muted earth tones. It’s pleasing and supple on the entry with a sleek yet attractively textured mouth-feel, elegant acidity, and nice balance throughout. Overall, a versatile and reasonably priced Pinot Noir that’s pleasing on its own, but is also extremely food-friendly. I enjoyed it with a nice slab of salmon. NOTE: For you alcohol hawks, yes it's from California and yes it's 12.5% ABV. Approximately 500 cases of this wine were produced. Region: Carmel Valley, California. (Other info: ABV 12.5%, 12 months in French oak, cork enclosure). 89 Points. Click here to find this wine.